Celebrating the UC Davis-CSIRO partnership, from left: Paul Dodd, associate vice chancellor, Interdisciplinary Research and Strategic Initiatives, Office of Research; Ana Lucia Cordova-Kreylos, strategic initiatives manager, Office of Research; Lindsay Adler, executive manager, global business development, CSIRO; Susan Lucas-Conwell, executive vice president, Silicon Valley office, CSIRO; and Justin Harsdorf, business development manager, agriculture and food, CSIRO. UC Davis recently announced new partnerships with two Australian entities to collaborate on agricultural research and development. Global Affairs, the Office of Research and faculty members facilitated the agreements. One is with the Commonwealth Scientific and Industrial Research Organization, or CSIRO, the country’s premier national science organization; the other is with Hort Innovation. CSIRO — The Office of Research led the UC Davis effort that resulted in CSIRO’s entering into its first major collaboration agreement with an American university. Ongoing mobility program, encouraging scientists from across the globe and disciplines to write joint proposals and do research together. “With the establishment of this collaboration, we have a great opportunity to accelerate our respective research programs by having our best scientists and engineers work together to address some of the most pressing challenges in the global agrifood sector,” said Paul Dodd, associate vice chancellor for research at UC Davis. Read more on the Office of Research website. Bryan Jenkins, distinguished professor and chair of the Department of Biological and Agricultural Engineering, led the UC Davis effort to establish the partnership, a two-year deal calling for research and information sharing in horticulture. 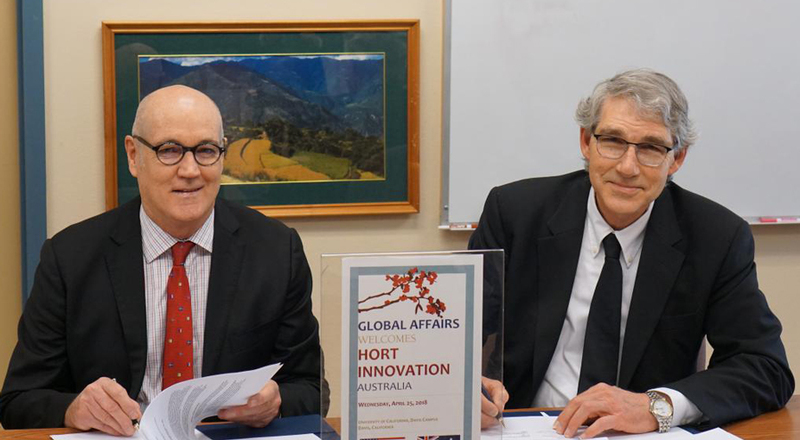 “In return, UC Davis will get the opportunity to work with leading Australian research providers through Hort Innovation to build on its knowledge and share resources to tackle some of the biggest issues our countries face in modern agriculture,” Lloyd said. Read more on the Global Affairs website.